New Right Chairman says response to murder should be implementing law docking money from PA for paying salaries of terrorists. 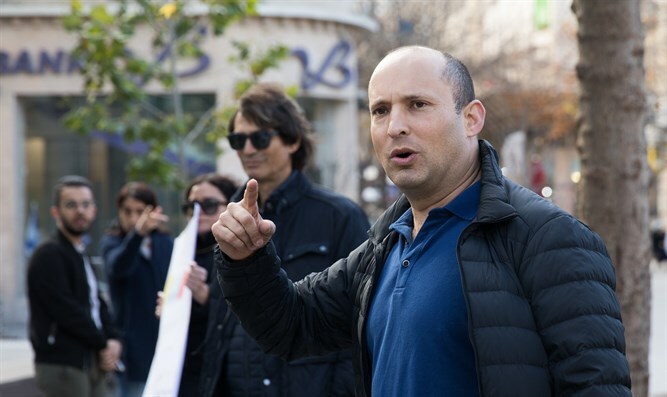 New Right Chairman Naftali Bennett called on Prime Minister Netanyahu to implement a law that would dock money that is used to pay jailed terrorists from the Palestinian Authority. Bennett's remarks come following the murder of Ori Ansbacher last week by a Palestinian Arab from Hebron. Bennett said that "this is among the most horrible and shocking murders that we have known. The abominable Palestinian terrorist who murdered Ori Ansbacher, is expected to receive a monthly salary of 20,000 NIS within a few days." "The terrorists stopped being afraid. At this moment, the terrorists are preparing the next terrible murder of Jews, because they know that they are expected to receive an economic "exit" for themselves and their families for the rest of their lives." "The prime minister must use the law to offset terrorist funds that have passed but have not yet been implemented," added Bennett. "I and Justice Minister Ayelet Shaked undertake to charge the Prime Minister with the political-security cabinet and to act to bring a majority of votes for this step, in the face of all international pressures." Bennett was talking about a law passed by MKs Elazar Stern (Yesh Atid) and Avi Dichter (Likud) last summer, which requires the Defense Ministry to present to the cabinet data on the scope of terror salaries and the finance minister to reduce by that amount the tax revenues that Israel collects for the PA. In recent weeks. the Defense Ministry has been working on data collection to find out the exact amounts the PA is paying to those who murdered Jews. According to the mechanism set forth in the law, after the report summarizing the phenomenon is presented, the offset will be carried out.